Hazelnut had her twins tonight. I went out to feed Desert and, out of habit, checked out the small shed in the far out pasture. I was really excited to see Hazelnut hanging over a baby and another behind her. This photo was taken half an hour later. 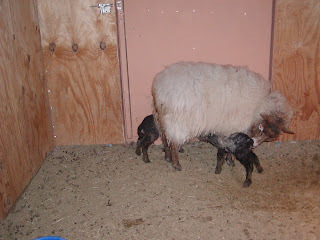 The lamb on the front is a ram and the larger one at the rear is an ewe. Marc and I put up a set of panels and a rug over the panel to keep out drafts and the other sheep. Both lambs are healthy and drinking, so no worries there. I need to go out once more to make sure that the afterbirth comes out. I had expected her or Columbian to deliver. Columbian has been fussing and was really uptight tonight. I think she was planning on using the shed. Hope she uses the large one. Tor was over yesterday and told me that none of the goats are as near as I think. He did admit that they could drop babies, as soon as he drove out of the driveway - that happened last year. Anyhow, I am glad to have babies that are alive and well. Now the name debate begins. I have decided to definitely go with desert plants and trees. I am thinking to use names like Organ Pipe Cactus for triplets, Prickly Pear and other names like that for twins. Will post nicer photos tomorrow and their names.